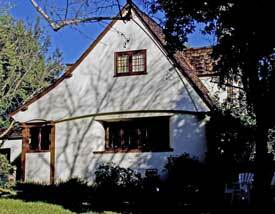 Sometimes considered a sub-category under Tudor Revival, the cottage style borrows heavily from English country cottages, the Arts and Crafts movement, and the medieval period. There are a number of cottage styles, such as Pointed Gothic cottages that have steeply pitched rooflines, and Cotswald cottages that have prominent brick or stone chimneys and quaint charm. Cottages ranged from small, modest bungalows to elaborate witchlike dwellings. The style goes by several names: English Country Cottage, Hansel and Gretel, Fairy Tale, Disneyesque, Hobbit Houses, and Storybook Houses. The style was very popular in the United States during the 1920s and 1930s. 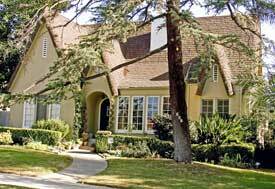 The style surged in popularity after a subdivision of cottage homes (Hollywoodland) was built in 1923. The theatrically designed homes served as residences in Los Angeles for a number of movie stars (Bela Lugosi, Humphrey Bogart, Gloria Swanson) and received nationwide media attention. 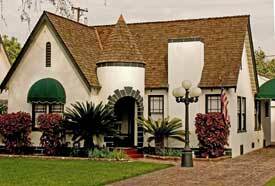 The Cottage style was very popular in Fullerton in the 1920s. In the late-1920s, local builder E. S. Gregory built a small tract of lovely cottages on the north side of the 1100 block of E. Whiting Avenue. 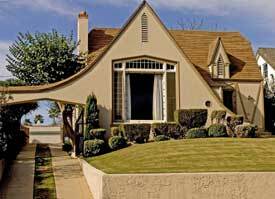 In 1927, the Fullerton Chamber of Commerce selected the Cottage style for a model home it built at 701 N. Richman Avenue to promote home buying in the city. Other Cottage style dwellings include the Henry Kroeger House (1927) at 901 E. Chapman Avenue and the Abbott House (1929) at 705 N. Richman Avenue. The Starbuck House (1927) at 834 N. Woods Avenue typifies an Irish country cottage. Other good examples of the style are found at 656 N. Golden Avenue (1927), 333 W. Brookdale Place (1931), 1121 E. Whiting Avenue (1928), and 1206 N. Lemon Street (1929). By the mid-1930s with the Depression in full force, the popular use of the Cottage style had vanished. Gellner, Arrol. Storybook Style: American's Whimsical Homes of the Twenties. New York: Viking Studio, 2001. Hobart, Christy. "Life Within a Fairy Tale: L.A. 's Fanciful Storybook Style Makes a Last Stand Against Convention-and the Wrecking Ball." Los Angeles Times, January 13, 2005: F1, F8. Powell, Christopher. Discovering Cottage Architecture. Buckinghamshire, UK: Shire, 2003.